Fatima Bint Asad was born into a household that was the center of spirituality. Her grandfather Hazrath Hashim b. Abd Manaf was the leader of Quraysh and keeper of Kaaba. He was a capable and generous man. He married a girl from his own family who gave birth to his son, Asad, who was father of Fatima Bint Asad. The Hashimi family in the tribe of Quraysh is well-known (famous) for its moral virtues and high (supreme) humanistic characteristics among the Arab tribes. Magnanimity, generosity, courage and so many other virtues are characteristics of Bani-hashim. Abdul Muttalib , who was a very discriminating man had assessed her nature, her intelligence and her capabilities from the very beginning and proposed her for his son, Abu Talib. Fatima bint Asad was a most remarkable lady who followed the religion of Prophet Ibrahim (A.S). She believed in Allah and acted according to all the previous Prophets instructions. She believed and acted upon all the Books of Allah which has been revealed till then (before Islam ). This shows that she and her husband were Muslims from the beginning and so they need not swear allegiance to Islam. Doubting the Iman Of Abu Talib (A.S) is liking degrading this pure and pious lady, as she was in his Nikhah till his death, that was ten years from the time of her accepting Islam. She was at such a level of Piety that any Dua she said was fulfilled immediately. Even though her life was spent within the four walls of her house Fatima bint Asad was an exemplary women. She took extreme care of her husband and loved her children and above all the Prophet (S.A.W). She cooperated with Abu Talib wholeheartedly and she was a mother pure and simple where the safety and well being of Muhammad [S.A.W] was concerned. No wonder he loved and respected her so highly. Fatima Bint Asad has the privilege to bring up five of the Holy Masoomeen (A.S). They were Mohammad (S.A.W), Imam Ali (A.S), Fatima Zahra (A.S) and for a short time Imam Hasan (A.S) and Imam Hussein (A.S) too. Where as no other lady has this privilege. She was also a member of the privileged group who migrated to Madinah. She had four sons, Talib, Aqeel, Ja’far and Ali (A.S) and two daughters, Umme Hani and Jumana, and above all Mohammad (S.A.W) her adopted son. Her home was the real cradle of Islam. Both Muhammad, the future Prophet of Islam, and Ali, the future paladin of Islam, were born in her house, and they grew up in it. Both of them were the “products” of her education. Her husband Abu Talib (A.S), figures as the greatest benefactor of Islam. She shared the distinction with him of rearing and educating Mohammad (S.A.W). Prophet Mohammad (S.A.W) Muhammad was deprived of his mother early in life but he soon found a second mother in Fatima bint Asad. He, therefore, did not miss the love and affection that a mother alone can give. She did not spare any pains and looked after the Prophet [S.A.W] in his infancy, boyhood and youth. She made sure that the Prophet (S.A.W) has the best of everything. She dressed and fed him well. If her husband protected Muhammad from his enemies outside, she provided him love, comfort and security at home. It was in her home that Muhammad found emotional security and the emotional closeness of a family. Fatima Bint Asad use to put her sons on the bed of the Holy Prophet (S.A.W) so that in time of danger, Prophet (S.A.W) would be safe and if any harm came it would be to her son. She sacrificed her sons for the sake of Islam. When Mohammad (S.A.W) left Mecca and Hazrath Ali slept in his place she did not utter a word, Although Ali (A.S) was in a grave danger. Aqeel Ibn Abi Talib He was born in 590. His Kuniyath was Abu Yazd. He accepted Islam at the time of Hudaibiya and reached Madina in 8th hijri. He fought in the Battle of Mu’tah. He became blind in his old age. He died at the age of 96. His son Muslim Ibn Aqeel was The first Martyr of Kerbala. He was Safeer-E-Hussain to Kufa. Muslim Ibn Aqeel’s two sons Mohammad and Ibrahim also met martyrdom in Kufa. Ja’far Tayyar was a famous General. He led the forces of Islam in the battle of Mu’tah and was martyred in the same battle. His both arms were severed and he held the standard of Islam with his teeth. He was the Winged Martyr of Islam. Fatima Bint Asad was exceptionally fond of her son Ja’far, she loved him more than the others because he resembled Muhammad [S.A.W] very much, and was extremely intelligent. But for the sake of Islam she bore the separation from him and his wife, Asma bint ‘Omais, (when they migrated to Abyssinia on the Prophet’s orders with the first group of Muslim migrants ). He seemed to have inherited the family’s mastery over language and was also an eloquent speaker who could win people over to his viewpoint. It was with this same skill that he had won over the king of Abyssinia when the Quraish appealed to him to surrender the Muslims to them. He had eight sons. His son Abdullah married Zainab (S.A) and Mohammad married Umme Kulsoom (A.S). Janab Abdullah Ibn Ja’far’s sons, Aun and Mohammad were martyred on the lands of Kebala. Ali Ibn Abi Talib Fatima Bint Asad ‘s younger son was Ali Ibn Abi Talib(A.S). No introduction is needed for this great Imam. But I like to mention some facts of his birth as it also concerns the great Lady Fatima Bint Asad. She stayed in the Ka’bah for three days and had the privilege of eating the fruits of heaven. At the time of the birth of the Prophet Jesus (Isa) (P) his illustrious mother was forced to leave the Holy House. A voice said to her: O MARY (MIRIAM)! LEAVE THE BAITU’L-MUQADDAS, SINCE IT IS THE PLACE OF WORSHIP AND NOT OF CHILDBIRTH. But when the time of Hazrat Ali’s birth approached, a voice was heard saying: O FATIMA BINT ASAD! ENTER THE HOUSE (KA’BAH). 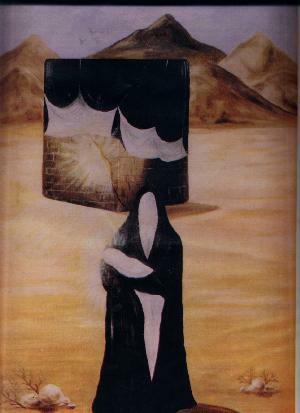 Fatima bint Asad leaned against the wall of the Ka’bah to rest. Miraculously, the wall opened. Fatima bint Asad entered and the wall closed behind her. ‘Abbas bin ‘Abd al-Muttalib, the Prophet’s (S.A.W) uncle witnessed this miracle. He and his companions rushed to the gate of the Sacred House, which was locked, and tried in vain to open it. Understanding that the Divine was at work there, he and his companions ceased to interfere. The news of this incident soon spread throughout Mecca. Imam Ali (A.S) was born within the Ka’bah with his eyes closed and his body in humble prostration before the Almighty Allah. Fatima stayed in the Ka’bah for three days and as the fourth day approached, she stepped out, carrying her baby in her arms. 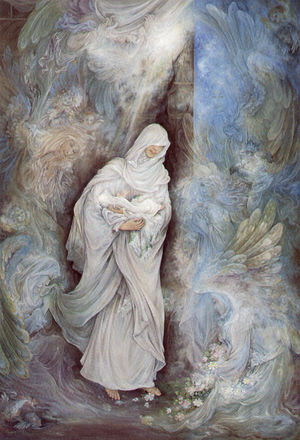 She found the Holy Prophet (S.A.W) waiting to receive the newly-born child in his anxious arms. So the first face that little Ali (A.S) saw in this world was the smiling face of the Apostle of God, Muhammad (S.A.W). Imam Ali’s (A.S.) birth inside the honored Ka’bah is unique in the history of the world. Neither a prophet nor a saint was ever blessed with such an honor. (A Brief History of the Fourteen Infallibles, World Organization for Islamic Services, (Tehran: 1984), pp. 51.52.) It is an undisputed historical fact recognized by all historians that the Holy Ka’bah is the birthplace of Ali bin Abi Talib (A.S). Glad tidings were brought to Abu Talib and his household. Upon their arrival at the Sacred House they saw Muhammad al-Mustafa (S.A.W) there with the child in his arms. (Ibn al-Sabbagh al-Maliki, al-Fusul al-Muhimmah fi Ma’rifat al-A’immah, Ch. 1, p. 13.) He carried the baby Ali to the house of Abu Talib, where he, himself was brought up. Fatima Bint Asad told that while she was inside the Kaaba, she kept hearing a voice say, Name this child Ali. The name Ali is an optimistic and cheerful name. It signifies nobility, eminence, and elevation. No one before Ali (A.S) had ever had that name, and no one before him or after him ever had the honor of being born inside the sacred walls of the Holy Kaaba. Now we will refer to the funeral of Fatima Bint Asad (A.S) during the Prophet’s (S.A.W) time. When Fatima Bint Asad (wife of Hazrat Abu Talib and mother of Imam Ali (A.S)) died,(23rd Safar as per a tradition) the Holy Prophet (S.A.W) was very much grieved. Anas bin Malik says that when the Prophet [S.A.W] got news of the death of Fatimah bint Asad, he immediately went to her house, sat beside her and prayed for her. He gave his shirt to be used as part of her shroud, saying he prayed to Allah to forgive her and give her the dress of Paradise. When the grave was prepared the Prophet [S.A.W] himself examined it and with his own hands placed her into the grave. Thus She was one of the few blessed people in whose graves the Prophet [ S.A.W] himself examined. Verily, the Messenger of Allah gave Kafan (shroud) to Fatima Bint Asad (mother of the leader of the Faithful) in his own robe, when the women finished washing her, he (S.A.W) carried her bier on his shoulder, and he remained under her bier till he bought it to her grave. The Holy Prophet (S.A.W) “remained under her bier” means that he did not carried it on his shoulder. In East Africa, a peculiar custom has been adopted: the son of the dead person remains “under the bier” literally; instead of carrying the bier or helping others carrying it, he places himself between those who are actually carrying the bier, and inconveniences them. Then the Holy Prophet (S.A.W) put her bier near the grave, and entered the grave and lay in it. Then he stood up and took the body in his hands and laid it into the grave. Then he put his face near hers whispering to her for a long time, telling her “your son, your son”. Then he came out, filled the grave and shaped it properly. Then he inclined towards the grave, and people heard him (S.A.W) saying: ‘There is no god but Allah. O Allah, I am giving her to thee in trust’ . “She kept her children hungry but made sure I got enough to eat. She did not comb her boys hair but put oil on my head and combed my hair”. whenever Islam was faced with heavy onslaught it was the sons of Abutalib (A.S) and Fatima Bint Asad who stood as a shield and stoically bore the brunt of all sorts of catastrophes and calamities including the deaths and exiles but did not budged from safeguarding Islam. Who would be unaware of the sacrifices of Hazrat Ali (A.S) and Hazrat Jaffer-e-Tayyar (A.S) in the initial stages of Islam? They were always ahead in every field in every arena, ever ready to sacrifice themselves in the cause of Islam. They were true sons of Abu Talib and Fatima Bint Asad and real images of their selfless services. Even in Karbala at many places the examples of their sacrifices and dedications can be seen. In the epoch-making event of Karbala whoever from Bani-Hashim had the privilege of attaining the much coveted martyrdom was a flower from the garden of Abi Talib and Fatima Bint Asad. Today wherever the name of Islam has survived it is the fruits of their sacrifices. The Garden of Islam owes its freshness to these flowers.